A veritable time-capsule of New England farming life, the village includes an 1896 Victorian train depot (currently in use as a Metro-North commuter station), an 1872 one-room schoolhouse, the former Gregory's General Store building, the former Cannondale Post Office building, historic barns for storage of agricultural produce awaiting shipment by train, and a former water-mill overlooking the secluded Cannondale Pond and 60 ft wide waterfall on the Norwalk River. 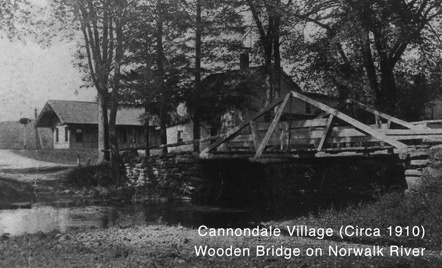 In the early 19th century the village of Cannondale (formerly known as Cannon's Station or simply Cannon's), along the Norwalk River, was distinct from the uplands immediately north and west, along Danbury Road. The Norwalk and Danbury Railroad, completed in 1852, made Cannondale the commercial center for all the surrounding residents, and more people built homes in the vicinity. Increasing building density erased the former division of open land between the two areas, until they formed the pattern of continuous settlement that exists today. 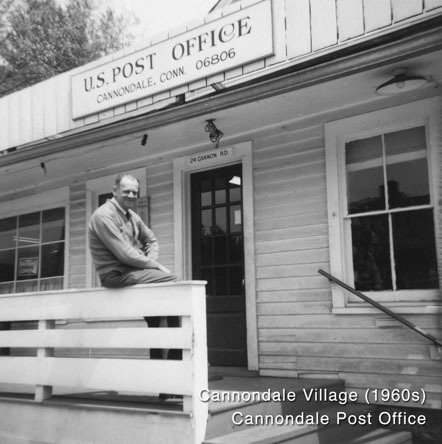 At least as early as the 1860s, the area constituted a town school district, and it was served by a single post office, which adopted the present name, Cannondale, in 1915. 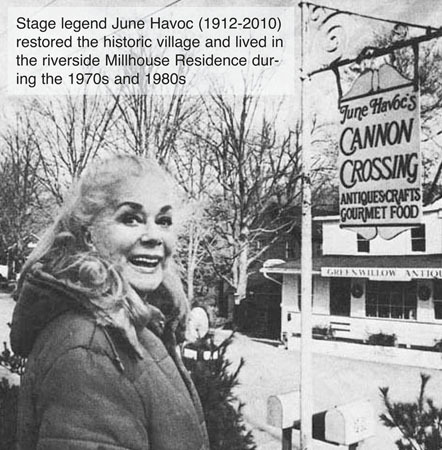 Cannondale Village, the area’s pre-Civil War rural hub, with 19th-century barns and buildings including a Victorian train station, was restored to its current state by actress June Havoc, who also lived through the 1970s and the 1980s at the expanded Millhouse Residence overlooking Cannondale Pond and Waterfall. Cannondale Historic District is significant because it embodies the distinctive architectural and cultural landscape characteristics of a small commercial center as well as an agricultural community from the early national period through the early 20th century. 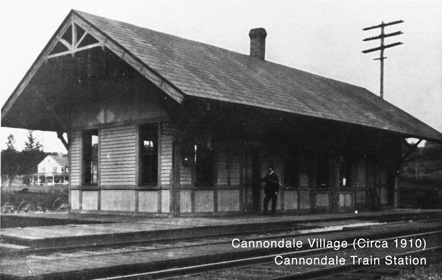 The historic uses of the properties in the Cannondale Historic District include virtually the full array of human activity in this region — farming, residential, religious, educational, community groups (the Grange), small-scale manufacturing, transportation, and even government (the building that housed the first Cannondale Post Office). The close physical relationship among all these uses, as well as the informal character of the commercial enterprises before the rise of more aggressive techniques to attract consumers, capture some of the texture of life as lived by prior generations. The buildings also include excellent examples of Federal, Greek Revival, Victorian, and Colonial Revival houses; vernacular houses from the entire period of significance; barns from the 19th century; a range of school buildings from early examples that resemble houses to the B.F. Brown Boarding School (33 Cannon Road), with its clearly institutional character; and specialized buildings such as the railroad depot. 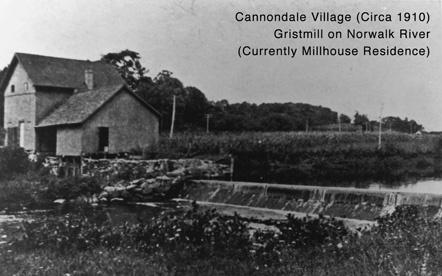 The historic significance of the Cannondale Historic District derives from its changing role in the life of the town, from clusters of farmsteads around a small centrally located gristmill, to an important commercial district in Wilton once the railroad opened in 1852, to an area whose commercial presence substantially declined upon the advent of automotive transport and whose bucolic qualities then attracted an increasing degree of leisure use beginning in the early 20th century. The area that became the Town of Wilton was originally part of the northern expanse of the Town of Norwalk, The earliest Anglo-European settlers arrived in the first decade of the 18th century. By 1726, some 30 families who had established farms in the area successfully petitioned to create their own parish, build their own church, and seat their own minister. The first church was built close to the southern boundary of what is now the Town of Wilton, a short distance west of the north-south thoroughfare known in the 18th century as "County Road," which closely followed the course of what is today known as Route 7 or Danbury Road. This placement of the church established the institutional center of Wilton far to the south of this district. Dozens of families had nonetheless settled farms in this area during the 18th century, and by 1790 John Cannon had established a small general-goods store near the river crossing. 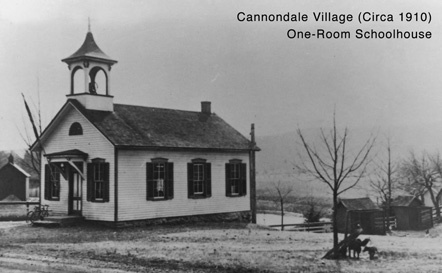 Cannondale emerged as a central place in the life of Wilton during the middle decades of the 19th century, with the construction of the Zion Hill Methodist Church and the Danbury and Norwalk Railroad. The church, constructed in 1844, contributed an institutional aspect to the architecture and use of the area, but the opening of the Danbury and Norwalk Railroad in 1852 fundamentally distinguished the district from so many other increasingly marginal agricultural communities in Connecticut. Convenient freight access allowed the Cannondale store to increase the volume and diversity of its offerings, and the increased foot and wagon traffic around the adjacent depot represented a substantial increase in the store's share of the local market. In addition to the store building itself, the long-time commercial role of Cannondale is conveyed by the two early 20th-century gasoline pumps that stand nearby. Freight access also stimulated a host of processing enterprises, of which scant physical signs remains except for the gristmill, dam, and the now-removed turbine which powered the mill. In the second half of the 19th century, other small enterprises nearby produced wagons and wagon parts, tools, and hardware products. Even at the height of manufacturing, in the 1880s, farmers still outnumbered nonfarmers in the area by a factor of two to one. Thus Cannondale retained substantial open land that was used for pastures and fields. In the early 20th century, this rural landscape combined with the Colonial Revival fashion in architecture to attract well-to-do New Yorkers to the area. Many of the farms gained a new use as weekend and summer retreats, and later as retirement homes. Several houses in the Cannondale Historic District were built in the 20th century specifically for this new purpose, notably the Marjorie W. Hands House at 63 Cannon Road. The Cannondale Historic District's buildings embody the distinctive characteristics of several periods and styles of architecture. The houses at 490 and 539 Danbury Road (Azor Beldon House) are representative of the center-chimney, gable-roofed clapboarded house typical of 18th-century Connecticut domestic architecture. Others stand as typical examples of Federal style architecture, with its emphasis on delicate Classical and geometric ornament. The Cannondale Historic District gains its distinctive character from its many well-preserved Greek Revival houses more than from any other style. The Hiram and Mary Cannon Jones House (436 Danbury Road), for example, has the temple-front form and bold detailing, especially the Ionic portico, that form the core of the style. The Zion Hill Church (470 Danbury Road) is also a quintessential example, featuring not only the standard form and details but also the flush-boarding (in the gable-end) that imitated the masonry construction of the temples from which this style drew its inspiration. The Victorian buildings in the Cannondale Historic District also add to its architectural significance. The railroad depot represents a specialized form of Gothic influenced Victorian styling, with its portion of vertical-board walls and heavy stickwork bargeboard and eave brackets, the latter also serving the utilitarian function of supporting a generous roof overhang that protected people waiting for trains from the fickleness of New England weather. The Cannon Grange Hall (25 Cannon Road) exhibits the Victorian practice of using mass-produced wooden ornament to dress up an otherwise plain building, in this case a long rectangular meeting hall that gains some distinction and visual interest by the use of patterned shingles in the peak and some simple decorative peak bracing. Even the more vernacular Victorian houses, and those made over in that period, feature the porch ornament, mixed shingled and clapboarded exterior, and often an ornamental gable treatment that characterized Victorian architecture as a whole. The Cannondale Historic District includes significant examples of Colonial Revival dwellings. The David Henry Miller III House (426 Danbury Road) and the Lewis Hurlbutt House (475 Danbury Road) have the shingled walls and Tuscan-columned porch with small pediments that typify the 20th-century emulation of the more ostentatious buildings of the 18th century. The Miller House also features the hip roof that adorned many such houses, and the Hurlbutt House sports a stylized Palladian window in its street-facing gable end. The Cannondale Historic District includes two buildings, Cannondale School (34 Cannon Road) and Godfrey Academy (20 Cannon Road), that were moved to their present sites from other locations within the district. Both contribute to the historical significance of the Cannondale Historic District for their association with its educational history, and the Cannondale School also contributes to the architectural significance as a well-preserved example of a Victorian school. The church, which is owned by a religious organization, contributes to the Cannondale Historic District as a well-preserved example of Greek Revival architecture and as one of the institutions that gave the area the sense of being a settlement. Similarly, the adjacent cemetery, with its typical pattern of rows of east-facing burials marked by white marble headstones, contributes to the appearance of the Cannondale Historic District as a 19th-century community. - Atlas of New York and Vicinity. New York, 1867. - McCahon, Mary. "Cultural Resource Survey of Wilton, Connecticut," Wilton, 1989. - Hubbard, G. Evans. Annals of Wilton, Volume III, Wilton Village: A History. Wilton, 1971. - Hurd, D. Hamilton. History of Fairfield County, Connecticut. Philadelphia, 1881. - Map of Fairfield County, Connecticut. Philadelphia, 1858. - One Hundred Fiftieth Anniversary of the Organization of the Congregational Church, Wilton. New York, 1876. - Cannondale: A Connecticut Neighborhood. Wilton: Wilton Historical Society, 1987. - Bruce Clouette and Matthew Roth, consultants, and John Herzan, Connecticut Historical Commission, Cannondale Center Historic District, nomination document, 1992, National Park Service, National Register of Historic Places, Washington, D.C.
* Adaptation copyright © 2010, The Gombach Group.